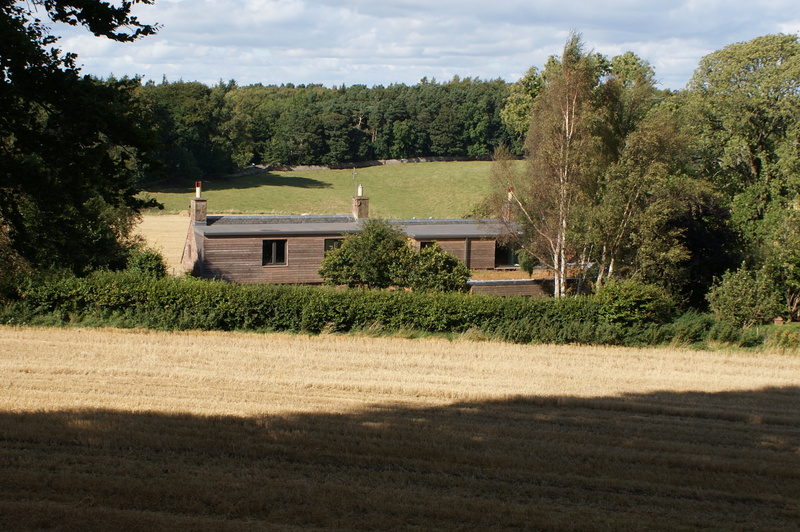 Share the post "Private Cottage, East Lothian"
Located near the village of Stenton in East Lothian, the owners of this traditional red sandstone cottage commissioned Icosis to re-work the interior layout and extend the existing building, in order to provide additional living space, and to allow a closer connection between the house and garden. The new single-storey extension bisects the lower area of the garden close to the house, opening with large sliding doors to a sweeping lawn to the east, and to a more private “courtyard” garden to the south-west. An existing cement-rendered roof extension to the rear of the cottage was over-clad in horizontal timber boarding to soften and visually link this to the new single-storey living area. New lead-clad dormers were added to the front of the cottage to take advantage of open views across fields and woodland, and an oak-framed carport has replaced a derelict outbuilding.